The Jacksonville Bulls and Memphis Showboats were both coming off of opening-week wins to start off the 1985 United States Football League season as they faced off on March 4. The visiting Showboats were coached by Pepper Rodgers, who guided the club to a respectable 7-11 record in its first season. QB Walter Lewis (pictured above) augmented his passing with impressive mobility and had tossed three touchdown passes in the first-week win over San Antonio. RB Leonard Williams, who had seen scant action in his 1984 rookie year, rushed for 136 yards in that contest as well. The defense was anchored by second-year DE Reggie White. Jacksonville, under Head Coach Lindy Infante, was coming off of a 6-12 first-year record but upset the defending-champion Baltimore Stars the previous week. However, injuries were a significant concern, especially at quarterback. Veteran Brian Sipe, obtained from New Jersey, went down with a shoulder separation against the Stars and while backup Robbie Mahfouz performed well in relief, he had suffered from a bout of the flu and missed practice during the intervening week. While ex-San Diego QB Ed Luther had just been signed, it would be Buck Belue making his first pro start. Belue had come out of the Univ. of Georgia and, after two years playing minor league baseball, spent ’84 on Jacksonville’s developmental squad. There were 40,112 fans in attendance for the nationally-televised Monday night game at Jacksonville’s Gator Bowl. The teams traded punts to start the contest before Walter Lewis, who failed to complete a pass in the first quarter, fumbled in the process of running for first down yardage and the Bulls recovered at their 40. But after driving to the Memphis 22, Brian Franco missed a 39-yard field goal attempt. As the game headed into the second quarter, and following another exchange of punts, the Bulls were able to pin the Showboats at their one yard line. The result was a Memphis punt that gave the home team good starting field position and the Bulls capitalized, advancing 46 yards in six plays. RB Mike Rozier broke several tackles as he spun up the middle on the way to an 11-yard touchdown. Franco added the extra point and Jacksonville had a 7-0 lead. The score remained unchanged at the half. Alan Duncan missed a 48-yard field goal try for the Showboats on the next series after the Jacksonville score and DB Henry “Gizmo” Williams had a 47-yard punt return for the Showboats that they were unable to capitalize on. Memphis had the ball first in the third quarter and drove 81 yards in five plays. Leonard Williams broke away for a 37-yard run and Walter Lewis capped the series with a pass to WR Greg Moser for a 22-yard touchdown on the next play. Duncan converted to tie the game at 7-7. Another exchange of punts ensued, with an apparent return for a TD by Jacksonville WR Reggie Butts nullified by a roughing-the-kicker penalty, and while the Showboats gained ground following the reprieve, a holding penalty and sack on third down forced them to punt in return. A 62-yard pass completion by the Bulls was called back due to another untimely penalty, this time for holding, and with the ball deep in their own territory, Belue fumbled and NT Paul Hanna recovered at the Jacksonville four. On the next play, Lewis ran around end for another Memphis TD. Duncan added the point after for a seven-point Memphis advantage. It got worse for the Bulls on the ensuing kickoff when Butts fumbled and DB Doran Major of the Showboats fell on the loose ball at the Jacksonville 25. Five plays later, Lewis bulled to another touchdown, barely breaking the plane of the goal line. Duncan’s extra point put the visitors ahead by 21-7. Early in the fourth quarter, the Bulls finally got on the board again when Belue tossed a two-yard scoring pass to WR Aubrey Matthews on a fourth down play. It capped a 10-play, 66-yard series highlighted by three key Belue scrambles. With Franco converting it was again a seven-point contest with 13:21 remaining in regulation. On the next possession, Lewis, throwing on the run, completed a pass to TE Mark Raugh for a gain of 50 yards to the Jacksonville 13, and, while the Showboats were unable to reach the end zone, that set up a 24-yard Duncan field goal and a ten-point cushion. Jacksonville had three more possessions, but the next two resulted in punts and the last ended when DB Leonard Coleman intercepted a Belue pass in the end zone with less than two minutes remaining to seal the 24-14 win for Memphis. The Showboats had the edge in total yards (328 to 251) while each team generated 15 first downs. Jacksonville turned the ball over three times, with the two in the third quarter especially damaging, to one suffered by Memphis. The Bulls compiled four sacks, to three by the Showboats. Walter Lewis, who completed just one pass in the first half, ended up hitting on 9 of 18 throws for 117 yards and a touchdown while giving up no interceptions. He also ran the ball 11 times for 76 yards and two TDs. Leonard Williams led the Showboats in rushing with 93 yards on 14 carries. Greg Moser had 5 catches for 72 yards and a touchdown. For the Bulls, Buck Belue completed 16 of 31 passes for 118 yards and a TD while giving up one interception, and he ran for 47 yards on 6 carries. 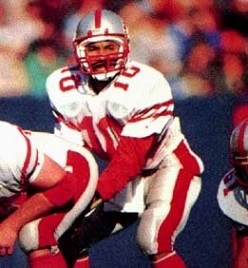 Mike Rozier led the rushers with 81 yards on 8 attempts that included a touchdown. Wide receivers Perry Kemp and Alton Alexis caught four passes apiece, for 42 and 39 yards, respectively. Memphis won again the next week and went on to an 11-7 record that placed third in the Eastern Conference. The Showboats thrashed Denver in the Quarterfinal playoff round before falling to the Oakland Invaders in their Semifinal game. The Bulls struggled to a 9-9 tally, finally hitting stride with four straight midseason wins after having gotten off to a 2-5 start, placing sixth in the conference. While Buck Belue performed capably in his first start, he eventually gave way to the veterans Brian Sipe and Ed Luther. For the season, he completed 37 of 68 passes for 299 yards and three touchdowns as well as three interceptions.